Sculptor Hannah Kidd seems to be extremely inquisitive about life; it’s human and animal subjects, as well as all their interactions, machinations, routines and idiosyncrasies. Indeed most of us enjoy observing our environment and inhabitants, however what makes sculptor Hannah Kidd special, is that she observes her surroundings and then celebrates its occupants in large drawings of a difference. In fact, three-dimensional steel framed and corrugated iron clad drawings, often life size or larger. 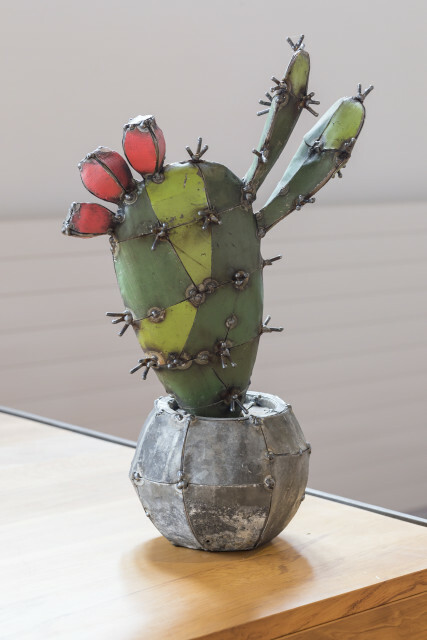 Invested with energy, humour, and inventiveness, these sculptures do not divulge the many hours it takes for Hannah Kidd and her assistant Sue Bamford to draw, raw, cut, bend, weld, attach and sometimes paint, her creations into existence. Kidd’s sculptures have all been constructed in her rural town studio in Methven, nestled beneath the mountains of the Southern Alps, New Zealand. Chihuahua’s, corgi’s, huge bulls, ducks, a Tui on Flax and many life-size humans, as well as huge lit up Kiwi slogans, All Black hero’s with lamps on their heads…Hannah Kidd’s imagination seems endless, as are the creatures that arise from it. The materials she works with are also unique. Although skilled in bronze casting, (as well as originally working in fiberglass sculpture), Kidd says that she found she wanted to make “big stuff” and so trained alongside a Methven Engineering firm, to learn about “making things strong enough that will stand up”. Firstly when creating her works, Kidd finds as many images as possible of the image she is making, and then using chalk on a tin bench, begins to draw a silhouetted outline. Using this two dimensional outline she will then work upwards, cutting and bending the steel rod into a three dimensional frame welding the many pieces together. The next process is cladding the object with welded corrugated iron, (often flattened out previously, by driving over the iron with a heavy roller on a friends farm). Sometimes the iron is left raw, rustic and unpainted or it is painted in acrylic or enamel paint. Possibly even lighting is added. For example in 2015, Kidd exhibited at the ‘Sculpture on the Peninsula’’(in Governor’s Bay), a large sculpture of a150kg ‘Golden Horse’ from steel frame and flattened corrugated iron, galvanized to make a statement and withstand the elements and then lit at the top with light bulbs to make it become an even more impressive figure within the night time environment. As well as physical impact, Kidd’s sculptures have a large emotional connection with their viewers and none more so, than the public works for the Christchurch Restart Mall after the 2011 Christchurch Earthquakes. After enduring such loss, fear and displacement, these artworks, (commissioned by the Scape Sculpture Trust for ‘Scape 8, New Intimacies’), brought to this injured community, the intimacy of the human condition into a public landscape that had been obliterated. These life-size figures installed on plinths made of pre purposed drainage sumps common to the CHCH earthquake rebuild, were created to interact with. We could help ‘Noel Peterson’ mow the lawn or watch as ‘Tanya Brown’ fed the misplaced earthquake cats. Everyday routines, intimacies and acts of small heroism were shown by Kidd to inspire and connect. Hannah has quickly risen to fame and has exhibited nationally and internationally. She graduated at 2001 from the Otago Polytechnic with a Bachelor in Fine Arts majoring in sculpture. In 2010 she won the Montalto Sculpture Prize (Melbourne), Australia and was the winner of Sculpture on the Peninsula (2017), Governor’s Bay, Christchurch. She has featured in “I’m sure I’ve seen that before”. Vienna, Australia, 2002, ‘Sculpture by the Sea’, Sydney, (2007,2009,2011) and ‘Sculpture by the Sea’, Denmark, (2009, 2011). In 2010 she won ‘The People s Choice’ at ‘Sculpture on the Shore’, Auckland and in 2012 was a finalist for the Monalto and New Zealand Wallace Art Awards. In 2017 she was the winner of the ‘Sculpture on the Peninsula’ (Governors Bay) prize for her work, ‘ Hot House’. Her work is held in both national and international collections.